George Mueller had an appointment on Friday at one o'clock, in Montreal. Problem was he was still stuck at sea, and he had been for days. 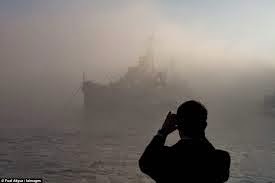 The ship was locked in heavy fog and the captain wouldn't dream of trying to venture closer to land under the circumstances. He hadn't reckoned with George Mueller who claimed he had never been late for an appointment and didn't intend to start now. Well the captain tried to reason with him, all the while wondering what kind of insane person he had on board.